The Lake Placid Speed Skating Club has a long and illustrious history that spans approximately 100 years. In the past, members would skate on the lake alongside the best speed skaters in the world, who would frequently train in Lake Placid. The club was very active in the local community, as witnessed by Lake Placid News clippings and scrapbooks from the 20s, 30s, and 40s reporting on club activities. Club President Henry Uihlein II (the club was then called the Lake Placid Skating Association) was instrumental in bringing Lake Placid's first International sporting event, the International Outdoor Speed Skating Championships, to Lake Placid in 1920. 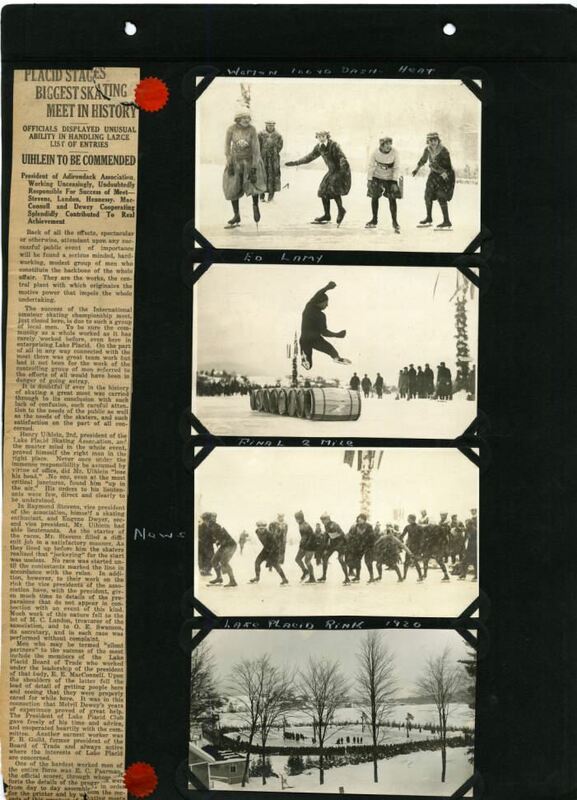 The above image is from Henry Uihlein II's scrapbook, and praises his work as President of the Lake Placid Skating Association (the former name of the Lake Placid Speed Skating Club). Prominent members of the Lake Placid Speed Skating Club have included Jack Shea; Charles Jewtraw; James "Bunny" Sheffield; Trevor Marsicano; and Mike Richter. After being named the Lake Placid Skating Association, then the Lake Placid Speed Skating Club for most of its incorporation, the name was changed to Adirondack Speed Skating Club (exact date this took place unknown). It was renamed Lake Placid Speed Skating Club by the Club Board in 2009, since the oval is located in Lake Placid and to return the club to its original name. Today the club hosts several meets every season at the Olympic Speed Skating Oval. For more information on Lake Placid Speed Skating, please contact us through our Contact Us Page.